Item # 317125 Stash Points: 395 (?) This is the number of points you get in The Zumiez Stash for purchasing this item. Stash points are redeemable for exclusive rewards only available to Zumiez Stash members. To redeem your points check out the rewards catalog on thestash.zumiez.com. 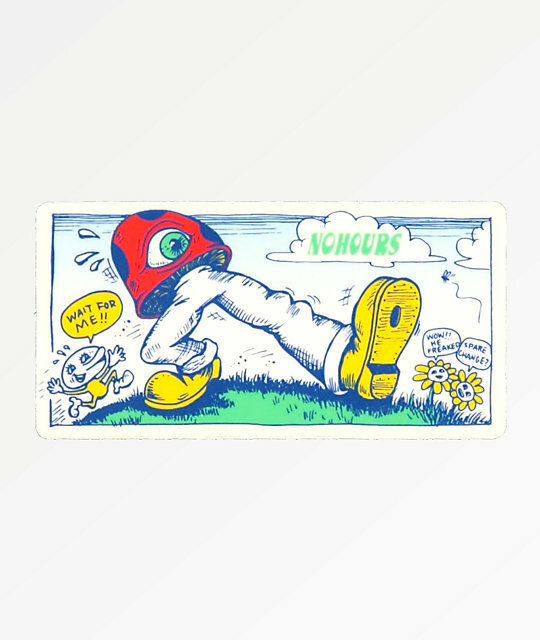 Add some trippy vibes to any surface with the Keep Trippin Sticker from NoHours. This peal and stick design features a graphic of a mushroom with legs and one eye, taking a trip through a grassy field, for a psychedelic design from NoHours. Keep Trippin Sticker from NoHours. Graphic of a mushroom with an eye and legs on a trip. 3.5" x 2" &vert; 9cm x 5cm (approx. ).